I have seen a post suggesting that in SE network a tags for the question should be shown ordered by the popularity (i.e., by the number of questions): Are the tags shown in a particular order? 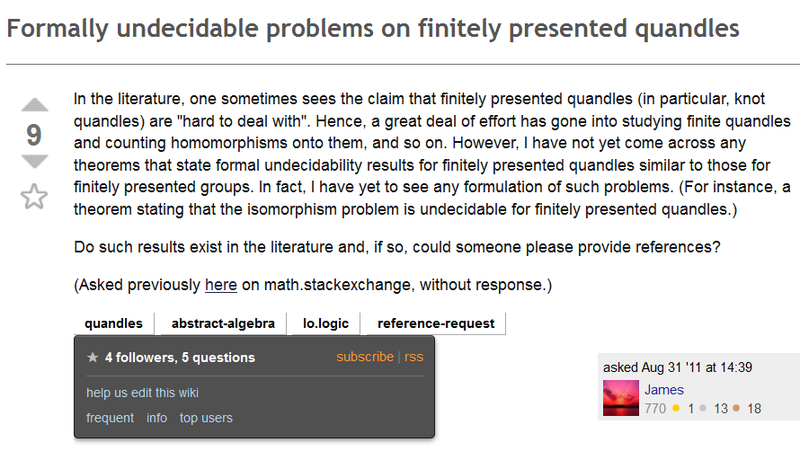 But when I view this question I see tags in this order: quandles, abstract-algebra, lo.logic, reference-request. The tag quandles only has 5 questions, so according to the rule I've mentioned above it should be shown last. Is MO behaving differently? (If yes, why?) Or is this a bug? I am not sure if this was preserved by design, or if it was an oversight when moving to the network that should be fixed. In any case, it is not a bug in the current behavior, but legacy from older behavior. In addition, but this is not the current case and secondary, it is also possible that in some cases the ordering deviates from the current popularity, since the popularity of the tags changed since the question was last edited. But this should be small effects only. Still one could consider this as reason to run some reordering script from time to time (perhaps this is in fact done, but did not yet happen for MO, not sure). Not the answer you're looking for? Browse other questions tagged support bug status-bydesign tags .